By Narjas Zatat for Independent. Archaeologists believe they have solved one of the history’s most puzzling questions – how the ancient Egyptians transported over 170,000 tons of limestone to build the Great Pyramid at Giza. New findings at the site on the outskirts of Cairo have revealed purpose-built boats were used to transport the huge stones. Archeologists have long known that some rock had been extracted eight miles from Giza in a place called Tura, while granite was quarried from over 500 miles away. The way in which these materials were transported, however, has long been a source of disagreement amongst academics. A group of archaeologists working at the Giza pyramid complex – an archaeological site – have unearthed an ancient papyrus scroll, remains of a boat and a network of waterways at the site of the pyramid, providing new evidence that points to how the oldest of the Seven Wonders of the Ancient World was built. The document was apparently written by a man called Merer who was in charge of 40 elite sailors. Archaeologists discovered that thousands of trained workers used boats to navigate canals dug along the River Nile for the purposes of transporting limestone. The boats were held together by thick, twisted ropes, some of which have survived and were found in good condition. After collecting the materials, workers would bring them to an inland port a few meters from the base of the pyramid. In total, some 2.3 million blocks of stone were shipped across the land over the course of two decades. 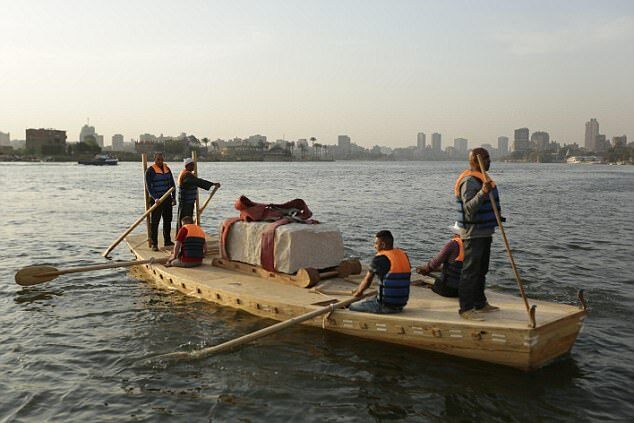 New proof shows how the Egyptians transported 2½-ton blocks for 500 miles. Blocks of limestone and granite built the tomb of Pharaoh Khufu in 2,600 BC. 170,000 tons carried along the Nile in wooden boats held together by ropes. Boats used purpose-built channels and canals to inland port yards from site. By Claudia Joseph For The Mail. Written by Merer, an overseer in charge of a team of 40 elite workmen, it is the only first-hand account of the construction of the Great Pyramid and describes in detail how limestone casing stones were shipped downstream from Tura to Giza. 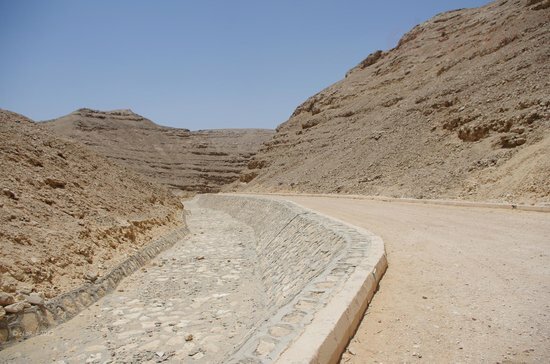 In his diary, Merer also describes how his crew was involved in the transformation of the landscape, opening giant dykes to divert water from the Nile and channel it to the pyramid through man-made canals. The latest tourist attraction at the Luxor Temple in Luxor, Egypt, is a towering statue of Ramses II, now fully restored for the first time since it’s 1958–60 discovery, when it was found in 58 pieces. The massive work measures 36 feet tall and weighs 82 tons. The black granite statue, which depicts the third pharaoh of the Nineteenth Dynasty of Egypt, was damaged during an earthquake in the fourth century. 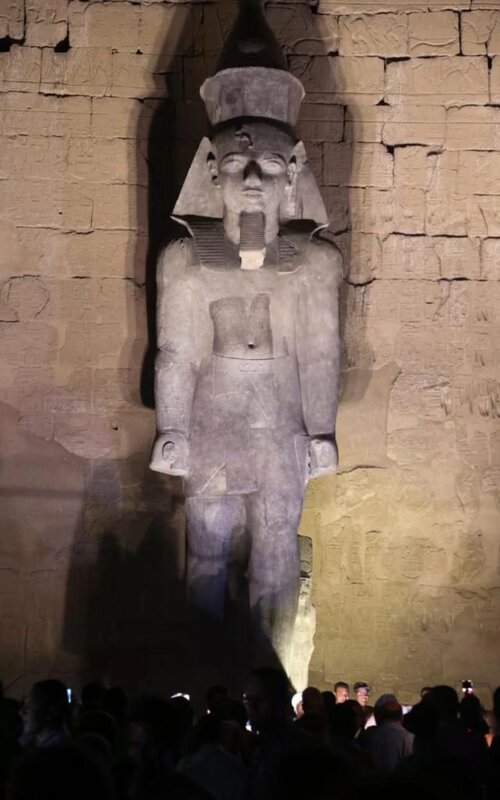 The unveiling of the restored colossus took place the evening April 18, just after Egypt announced the discovery of the 3,500-year-old tomb of the nobleman Userhat. A newly restored colossus statue of king Ramses II is seen at the Luxor Temple in Luxor. Courtesy of Ahmed Gomaa/the Egyptian Antiquities Ministry. “There are 10 coffins and eight mummies. 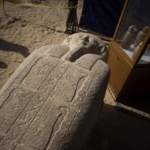 The excavation is ongoing,” Mostafa Waziri, head of Luxor Antiquities, told Agence France Presse of the new discovery. The tomb contains more than 1,000 funerary statues. The coffins, some of which were added some 500 years after the tomb was initially built, are said to be mainly well-preserved. A dramatic floodlit ceremony served to debut the Ramses statue in front of the walls of the Luxor temple on the bank of the Nile River. Also known as Ramses the Great or Ozymandias, as immortalized in the Percy Bysshe Shelley poem, Ramses II ruled from 1279–1213 BC, and was known for his building projects and successful military expeditions. His statue at Luxor would have originally stood alongside five others in front of the temple’s first pylon, or two-towered gateway. Restoration work on the statue began in November 2016. It was first discovered by an archaeological team led by Mohamed Abdel-Qader. Members of an Egyptian archaeological team work on a wooden coffin discovered in a 3,500-year-old tomb in the Draa Abul Nagaa necropolis, near the southern Egyptian city of Luxor, on April 18, 2017. 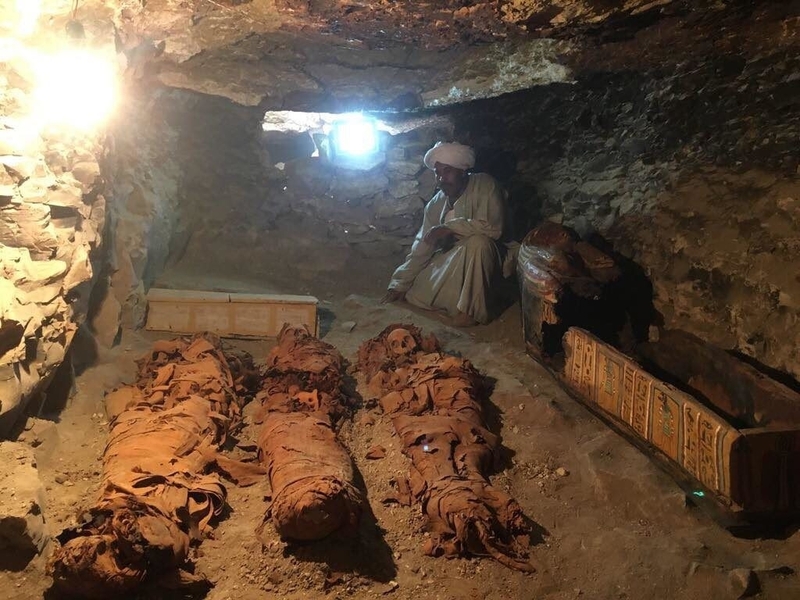 Egyptian archaeologists have discovered six mummies, colorful wooden coffins and more than 1,000 funerary statues in the 3,500-year-old tomb, the antiquities ministry said. Courtesy of Stringer/AFP/Getty Images. “What we’re happy with is that (the kind of tourists drawn to) classical Egypt, Luxor, Aswan, Nile cruises… are back to normal levels again,” Hisham El Demery, chief of Egypt’s Tourism Development Authority, told Reuters. His optimism comes despite an ISIS attack this week near St. Catherine’s Monastery in Sinai that killed a police officer and wounded four. The drumbeat of Egyptian archaeological discoveries continues, with that country’s Ministry of Antiquities revealing that it has uncovered an ancient tomb belonging to an Egyptian goldsmith named Amenemhat. The site is just the latest archaeological find in the Draa Abul Naga necropolis, located near the Valley of Kings in the city of Luxor, some 400 miles south of Cairo on the Nile River. 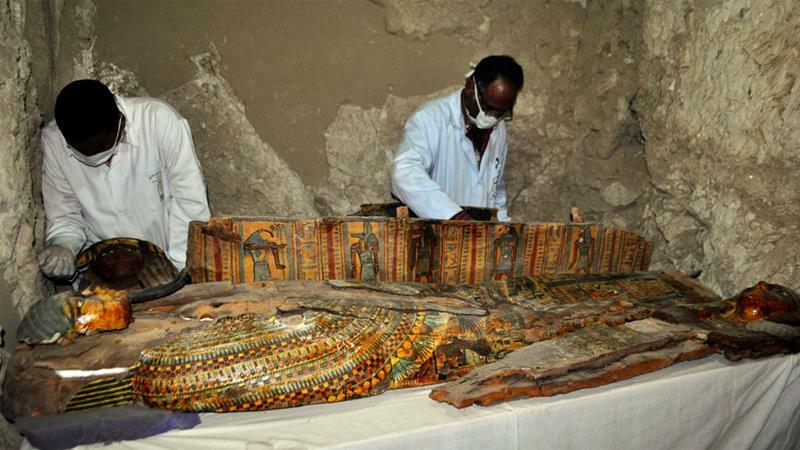 Egyptian archaeologists unearthing mummies at a newly-uncovered ancient tomb in Luxor. Courtesy of the Egyptian Antiquities Ministry. Lead archaeologist Mostafa Waziri stressed that an Egyptian team, rather than foreign professionals, was responsible for the find. About 3,500 years old, the tomb is thought to date to the 18th dynasty. Amenemhat was a jeweler, and his tomb was dedicated to Amon-Re, the main Egyptian deity. Inside, archaeologists found a statue of Amenemhat and his wife, featuring a portrait of their son between them. The site also contained 150 small carved wood, clay, and limestone funerary statues. Archaeologists found two separate burial shafts, both of which contained mummies. Later sarcophagi, from the 22nd and 21st dynasties, were also excavated. “We are not sure if these mummies belong to Amenemhat and his family,” Waziri told the New York Times. 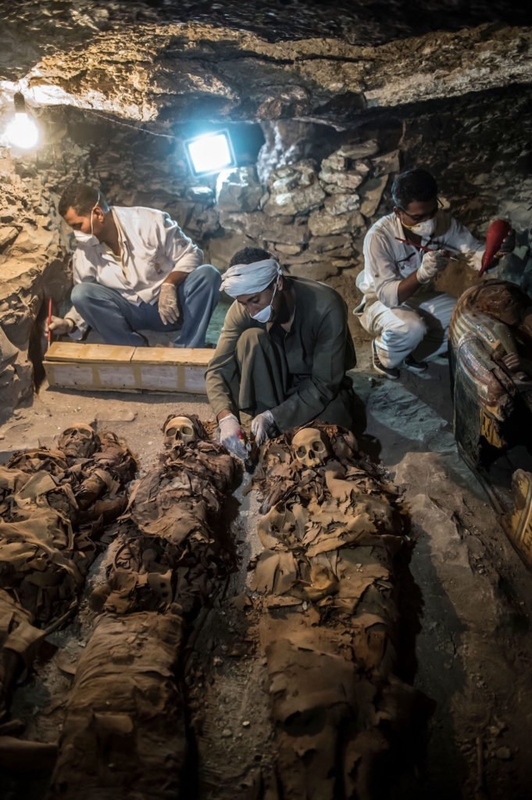 Egyptian archaeologists unearthing mummies at a newly uncovered ancient tomb in Luxor. Courtesy of Khaled Desouki/AFP/Getty Images. The latest find follows other recent discoveries in the region. 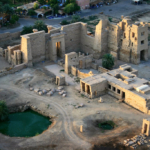 Last November, archaeologists discovered a lost city thought to be Egypt’s first capital. In April, a Japanese team unearthed a 3,500-year-old tomb belonging to an ancient Egyptian nobleman named Userhat. It was work on the latter site that first offered clues about the whereabouts of Amenemhat’s tomb, according to CNN. The country hopes excitement over archaeological sites can help boost tourism levels, which have remained low in the years following the 2011 ousting of former president Hosni Mubarak. Egypt has since struggled with political instability, as well as car bombings and other terrorist attacks. The spate of recent discoveries has led to a 170 percent increase in tourism between January and July, according to the Times. El-Amarna Royal Tomb (EA26) – There are two groups of rock-cut tombs at el-Amarna situated at the north and the south ends of the cliffs encircling the city of Akhetaten. These are the tombs of favored officials of the court of Akhenaten, containing many scenes depicting the royal family in the distinctive style of Amarna art. Between the north and south tombs lies the entrance to the Royal Wadi (Wadi Abu Hasa el-Bahri) in which the king’s own tomb was constructed. The entrance to the Royal Wadi is often said to take the form of the hieroglyphic symbol of the horizon, the akhet in the center of which the sun rises each morning. It was perhaps this natural shape which determined Akhenaten to site his new city here on the wide sandy plain on the east bank of the Nile. Until recently the wadi has been a fairly inaccessible place with a narrow boulder-strewn track leading to the Royal Tomb. Akhenaten’s tomb lies in a small side valley of the main wadi – which used to entail a tough walk of 6km each way from the mouth of the wadi. However, since 2004 there is a new tarmac road going all the way up to the Royal Tomb, making access for visitors much easier. 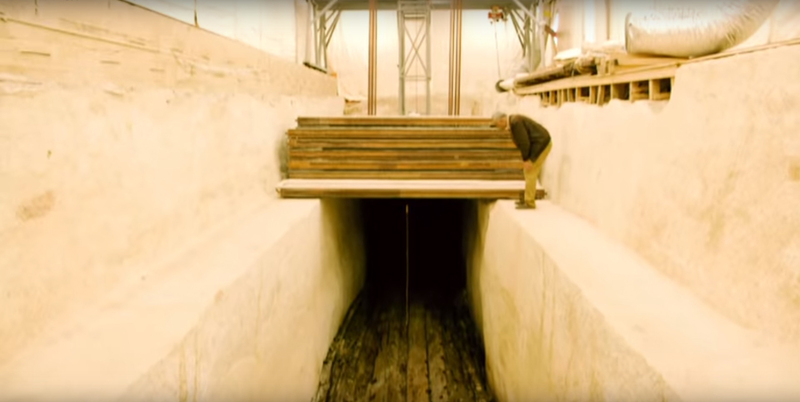 There is a generator to provide lighting in the tomb, which is currently undergoing restoration. Although much of the decoration once carved into the plaster over poor quality limestone walls is now destroyed, the tomb itself is a very evocative place. The Royal Tomb began with similar proportions to the earlier tombs in the Valley of the Kings at Thebes. However, several chambers for subsidiary burials of members of the royal family were cut after the early death of the king’s second daughter Meketaten. Was the king ever buried here? This is a question which is impossible to answer with certainty, although fragments of Akhenaten’s sarcophagus and a great number of shabti figures belonging to the king were discovered, suggesting that the king was interred here after his death, probably in year 17 of his reign. When the tomb was first found in the 1880s by locals it was already plundered and badly damaged. The entrance to the Royal Tomb is at the level of the valley floor and faces east, suggesting that it may have been designed to allow the sun’s rays to illuminate the tomb each morning. Alternatively, it may have been the king’s intention that divine energy flooded out of the tomb at sunrise to awaken the temple and the city. A steep flight of stone steps, with a central ramp to allow access for the sarcophagus during construction, leads down into a wide sloping corridor. At the far end of the corridor is a large square chamber with remains of two square rock-cut pillars on a raised platform – the king’s burial chamber. The chamber originally had four pillars, but two were probably cut away when extra space was needed for the sarcophagus of the king’s mother, Tiye, fragments of which were identified in recent years. A small chamber was also begun in the upper right-hand wall but left unfinished. Fragile traces of decoration at ceiling level can still be made out, giving the names and titles of the Aten, Akhenaten and Nefertiti, but little else now survives. The scenes which once decorated the walls of the royal burial chamber were of offering ceremonies to the Aten at which the royal family officiated. A well was constructed in front of the king’s burial chamber, a feature which was to appear in many later royal tombs at Thebes. The walls which form a chamber at the top of the well shaft were once plastered and decorated with reliefs of the royal family. Beyond the well, back towards the tomb entrance, at the top of a short flight of stairs, a doorway leads to a series of three apartments. Since their discovery, they have been known as chambers alpha, beta, and gamma and were identified as the funerary chambers of Princess Meketaten. The central chamber (beta) is undecorated, but the two other rooms were decorated with carved and painted scenes of the royal family making offerings to the Aten. In chamber alpha, there are important scenes depicting the king and queen mourning the death of a woman on a funeral bier. Behind the royal couple, a nurse carries an infant in her arms and the presence of a fan-bearer suggests that the child was also royal. The assumption is that the death represents a mother after childbirth. Although better preserved than other chambers in the Royal Tomb, the scenes in chamber alpha are damaged and the woman is not named, but a similar death-bed scene in chamber gamma names the deceased as Princess Meketaten. This gives rise to the idea that all three chambers belonged to the king’s second daughter, who probably died in childbirth. This assumption has been recently challenged and it is now suggested that the body represented on the walls of chamber alpha may have been another royal lady – possibly the king’s lesser wife Kiya, who is a candidate for the mother of Tutankhamun, or even another daughter. Details of the reliefs in these chambers were copied by French epigraphists in 1894 at a time when the scenes were still almost complete, and without these drawings, we would know even less than we do about the mysterious occupant of these apartments. Further along the main corridor towards the entrance, another doorway opens into a further winding corridor leading to a series of chambers. It is suggested that this may have been a secondary royal tomb intended for the burial of Queen Nefertiti or the reinterment of Amenhotep III, but it was left unfinished and undecorated. The mysteries of the Amarna Royal Tomb seem only to increase with time and with each new investigation. Several other tombs had been quarried in the Royal Wadi, both in the main wadi and in the northern and southern side-valleys, but all of them were left unfinished. Many artifacts have been found over the years in the area of the Royal Tomb, leading to diverse theories about the history of the royal family, but we are still left with very little real evidence from this enigmatic period of history. The riverscape of Aswan is dominated by the sand-covered hills of the West Bank which is strewn with rock-cut tombs of high-status officials of the Old and Middle Kingdom. At the crest of the hill is the domed tomb of a Muslim prophet which gives the hill its local name, Qubbet el-Hawa or ‘Dome of the Winds’. The ticket office is to the northern end of the tomb area and a steep climb up several flights of stone steps leads to the upper level of the cemetery where there are around 6 or 7 tombs open to visitors. The guide will usually begin at the southern end of the upper level where the most interesting tombs can be seen. These ancient tombs are roughly cut from the natural rock, and though they are not as well preserved as some of those to be visited in the Luxor or Cairo areas they are well worth seeing. Tombs of this period are usually fairly inaccessible in most places south of Cairo and these show fine examples of hieroglyphic texts detailing the careers of their owners as well as scenes of daily life in the earlier periods. Many of the tombs are linked together as family members added their own chambers. The owners of these tombs were father and son, both Overseers of Upper Egypt in Dynasty VI during the reign of Pepy II. Reliefs on the walls of Mekhu’s tomb record his murder while on an expedition in Nubia and the revenge taken by Sabni, his son. He seems to have been buried with much ceremony. The tombs were roughly constructed in Old Kingdom style, with small obelisks at the entrance doorway and an offering table of Mekhu still in situ. The next major tomb in the sequence is that of Sarenput II, Overseer of the Priests of Khnum and Commander of the Garrison at Elephantine, dated to the reign of Dynasty XII king, Amenemhet II. This is one of the best-preserved tombs at Aswan. It consists of a large chamber with six perfectly symmetrical undecorated pillars and a gallery flanked by six niches each once containing mummiform statues of the deceased prince. The four pillars of a second chamber were decorated with images of Sarenput. Beyond this, a chapel cut deep into the rock is plastered and painted in vivid colors and depicts his wife, a Priestess of Hathor and other family members. In the niche at the back of the chapel, Sarenput is named as ‘Hereditary Lord’. This biographical text is very colourful with well-depicted hieroglyphs and shows the cartouche of ‘Nebkaure’ – Amenemhet II as well as an unusual glyph of an elephant. The style of painting and the hieroglyphs are distinctly similar to the Old Kingdom tombs, leading some Egyptologists to suggest that the same artists decorated them and that the length of the 1st Intermediate Period was therefore very short. This is a Dynasty VI tomb, its owner Khunes was a Lector Priest and Chancellor. A side chamber to the left of the entrance was re-used as a Coptic cell and another chamber on an upper level was a serdab. The tomb contains scenes of the deceased and his family in daily life. Harkhuf was an Overseer of Foreign Troops during the reigns of Pepy I, Merenre and Pepy II in Dynasty VI. This tomb is famous for Harkhuf’s biographical text and a copy of a letter from Pepy II requesting that Harkhuf should hurry to bring the young king a dancing pigmy from an expedition into Africa. The owner of this tomb was another Overseer of Foreign Troops during the reign of Pepy II of Dynasty VI. The tomb has a columned façade, biographical texts and good reliefs showing hunting and bull-fighting scenes. Heqa-ib was the deified official whose cult chapel stood on Elephantine Island. The last major tomb on the upper level dates from Dynasty XII and the reign of Senwosret I. Sarenput I was a Governor of Elephantine and Overseer of the Priests of Satis. A columned court has scenes on the rear walls of the deceased hunting and fishing with his dogs and his sandal-bearer. In a hall with four columns, there are scenes of daily life, a boating scene and a biographical text with finely painted hieroglyphs. A chamber at the rear of the tomb has a ‘false door’. Note the causeways which run down the hillside from the different cemetery levels. These would have been the original ‘paths’ to the tombs and coffins and burial goods would have been dragged up these steep inclines from the river. At night the whole cemetery area is floodlit and can be seen from all over Aswan. The tombs are mostly quite deep in the hillside and therefore very dark. Photography is not usually allowed. To get to the Tombs of the Nobles, there is a ferry which leaves from the northern end of the Corniche. Alternatively, you can hire a felucca which will wait and bring you back. You could also combine a visit to the tombs with a longer felucca trip. It is possible that there were once two separate gods with the same name, but equally likely that Amun of Heliopolis merely took on the attributes of the Theban god Montu (Montju) when he replaced him as the principal god of the nome in the later period. His name is generally translated as “the hidden one” or “the secret one” and it was thought that he created himself and then created everything else while remaining distanced and separate from the world. In that sense he was the original inscrutable and indivisible creator. When he merged with Ra he became both a visible and invisible deity. This duality (the hidden god and the visible sun) appealed to the Egyptian concept of balance and duality leading to an association between Amun-Ra and Ma´at. Amun was also identified with Montu (who he pretty much absorbed) and the hybrid gods Amun-Ra-Atum, Amun-Re-Montu, Amun-Re-Horakhty, and Amun-Min. Amun was associated with a number of animals, whose form he sometimes took in inscriptions. Originally he was depicted as a goose and given the epithet the “Great Cackler” (like Geb). It was also thought that he could regenerate himself by becoming a snake and shedding his skin. However, he was most frequently depicted as a Ram, a symbol of fertility. He is also depicted as a man with the head of a ram, a frog, a Uraeus (royal cobra), a crocodile, or as an ape. Finally, he is depicted as a king sitting on his throne wearing the double plumed crown (also associated with Min). During the Ptolemaic period images of Amun were cast in bronze in which he was depicted as a bearded man with four arms the body of a beetle, the wings of a hawk, the legs of a man and the paws and claws of a lion. Amun is described as the primeval creator in the Pyramid Texts which depict him as a primeval deity and a symbol of creative force. However, he rose to prominence during the Eleventh dynasty when he replaced the Theban war god, Montu, as the principal deity of the city. From that point, the fortunes of the God were closely linked to the prominence of Thebes itself. When the Theban Ahmose I successfully expelled the Hyksos from Egypt, he was quick to show his gratitude to Amun and throughout the Middle Kingdom, the Royal family established temples to Amun, most notably the Luxor Temple and the Great Temple at Karnak. During the New Kingdom, he gained such power that it is almost possible to argue that Egypt had become a monotheistic state. Amun-Ra was considered to be the father and protector of the pharaoh. The Theban royal women wielded great power, and influence and were closely involved with the cult of Amun. Queen Ahmose Nefertari (the Great Wife of the Pharaoh Ahmose I) was granted the title “God’s Wife of Amun” with reference to the myth that Amun created the world by masturbation. This title was then granted to the Great Wife of every Pharaoh in recognition of her role in the state religion of Amun. The female Pharaoh Hatshepsut went one stage further and specifically stated that Amun had impregnated her mother (in the guise of the Pharaoh Thuthmoses II, her father). Thus she established her right to rule on the basis that she was his daughter. However, the god could also reveal his will through the oracles, who was in the control of the priests and they had been granted so much land that they even rivaled the power of the Pharaoh. Amenhotep III instituted some reforms when he became concerned that the Theban clergy had become too powerful, but his son (Akhenaten) went one further and actually replaced Amun with the Aten and constructed a new capital city named Akhetaten. However, the experiment was short-lived and both Amen and Thebes were reinstated under the rule of Tutankhamun. The worship of Amun even spread into neighboring countries, particularly Nubia. By the Twenty-fifth dynasty, Amen-Ra was the principal god of the Kingdom of Napata (Nubia) who believed he came from Gebel Barkal (in northern Sudan) and the Greeks considered him to be the equivalent of Zeus. His main celebration was the Opet festival, in which the statue of Amun traveled down the Nile from the temple of Karnak to the temple of Luxor to celebrate Amun”s marriage to Mut (or Taweret). In this festival, he had a procreative function epitomised in his title “Ka-mut-ef” (“bull of his mother”). Amun, reconstructed Egyptian Yamānu (also spelled Amon, Amoun, Amen, Zeus Amun, and rarely Imen or Yamun, Greek Ἄμμων Ammon, and Ἅμμων Hammon), was a god in Egyptian mythology who in the form of Amun-Ra became the focus of the most complex system of theology in Ancient Egypt. Whilst remaining hypostatic, Amun represented the essential and hidden, whilst in Ra he represented revealed divinity. As the creator deity “par excellence”, he was the champion of the poor or troubled and central to personal piety. Amun was self-created, without mother and father, and during the New Kingdom, he became the greatest expression of transcendental deity in Egyptian theology. He was not considered to be immanent within creation nor was creation seen as an extension of himself. Amun-Ra did not physically engender the universe. His position as King of Gods developed to the point of virtual monotheism where other gods became manifestations of him. With Osiris, Amun-Ra is the most widely recorded of the Egyptian gods. He was also widely worshipped in the neighboring regions of Ancient Libya and Nubia. Horus is one of the oldest and most significant deities in ancient Egyptian religion, who was worshipped from at least the late Predynastic period through to Greco-Roman times. Different forms of Horus are recorded in history and these are treated as distinct gods by Egyptologists. These various forms may possibly be different perceptions of the same multi-layered deity in which certain attributes or syncretic relationships are emphasized, not necessarily in opposition but complementary to one another, consistent with how the Ancient Egyptians viewed the multiple facets of reality. He was most often depicted as a falcon, most likely a lanner or peregrine, or as a man with a falcon head. The name Horus is Greek. In Ancient Egypt he was known as “Heru” (sometimes Hor or Har), which is translated as “the distant one” or “the one on high”(from the preposition “hr” meaning “upon” or “above”). He was considered to be a celestial falcon, and so his name could be a specific reference to the flight of the falcon, but could also be seen as a more general solar reference. It is thought that the worship of Horus was brought into Egypt during the predynastic period. He seems to have begun as a god of war and a sky god who was married to Hathor, but soon became considered as the opponent of Set, the son of Ra, and later the son of Osiris. However, the situation is confused by the fact that there were many Hawk gods in ancient Egypt and a number of them shared the name Horus (or more specifically Har, Heru or Hor). Furthermore, the gods Ra, Montu and Sokar could all take the form of a falcon. Each “Horus” had his own cult center and mythology, but over time they merged and were absorbed by the most popular Horus, Horus Behedet (Horus of Edfu). He was the protector and patron of the pharaoh. As Horus was associated with Upper Egypt (as Heru-ur in Nekhen) and Lower Egypt (as Horus Behedet or Horus of Edfu) he was the perfect choice for a unified country and it seems that he was considered to be the royal god even before unification took place. The Pharaoh was often considered to be the embodiment of Horus while alive (and Osiris once he was deceased). 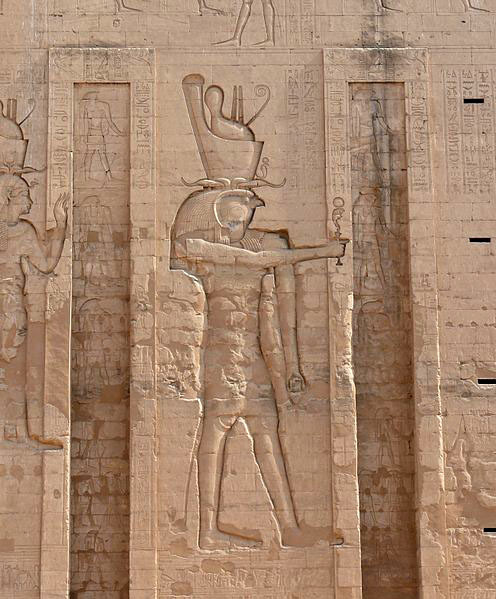 The Turin Canon describes the Predynastic rulers of Egypt as “the Followers of Horus”, and the majority of Pharaohs had an image of Horus at the top of their serekh (a stylised palace facade in which one of the king´s name was written). However, Sekhemhib (Seth Peribsen) chose to place Horus´ opposite and enemy Set on his serekh while Khasekhemwy placed both Set and Horus above his serekh. As a result, some scholars argue that the mythical battle between Horus and Set was once a real battle between the followers of Set and the followers of Horus. If this was the case, it would seem that the followers of Horus won as Horus remained a popular emblem of kingship while Set was gradually transformed into a symbol of evil. The Pharaoh also had a name (known as the “Golden Horus” name) which was preceded by an image of a sacred hawk on the symbol for gold which specifically linked the Pharaoh to the god. However, it is interesting to note that Set was also known as he of Nubt (gold town), so the symbol for gold could, in fact, relate to him. Horus and Set were always placed in opposition to each other. However, the exact nature of their relationship changed somewhat over time. Set was the embodiment of disorder and chaos while Horus was the embodiment of order. Similarly, Horus represented the daytime sky while Set represented the nighttime sky. However, in early times the two were also seen as existing in a state of balance in which Horus and Set represented Upper and Lower Egypt respectively. They were often depicted together to indicate the union of Upper and Lower Egypt and there is even a composite deity named Horus-Set, who was depicted as a man with two heads (one of the hawk of Horus, the other of the Set animal). At this stage, Horus was often considered to be Set´s brother and equal and the fight between them was thought to be eternal. However, the rise in importance of the Ennead resulted in Horus being cast as the son of Osiris and thus the nephew of Set. This changed the nature of the conflict between them, as it was now possible for Set to be defeated and for Horus to claim the throne of Egypt as his own. The “Eye of Horus” was a powerful protective amulet and when it was broken into pieces (in reference to the time Set ripped out Horus’ eye), the pieces were used to represent the six senses (including thought) and a series of fractions. Horus was also the patron of young men and was often described as the perfect example of the dutiful son who grows up to become a just man. However, this is perhaps debatable in the light of one of the stories concerning his fight with Set. The mother of Horus (Isis) was a great magician who most certainly had the power to destroy Set. However, when her chance came she could not take it. Set was, after all, her brother. This angered Horus so much that he chopped off his mother’s head in a fit of rage! Thankfully, Isis was more than able to handle this insult and immediately caused a cow’s head to grow from her neck to replace her head. Luckily for Horus, Isis was a compassionate and sympathetic goddess and she forgave her vengeful son his aggressive act. The Egyptian God Horus was usually depicted as a falcon or a falcon-headed man. He often wore the Double Crown of Upper and Lower Egypt. In anthropomorphic form Horus appears as both an adult man and a child, wearing the sidelock of youth (as the son of Isis). There are also numerous depictions of a Horus the child hunting crocodiles and serpents and amulets are known as “cippi” were inscribed with his image to ward off dangerous animals. Since Horus was said to be the sky, he was considered to also contain the sun and moon. It became said that the sun was his right eye and the moon his left, and that they traversed the sky when he, a falcon, flew across it. Later, the reason that the moon was not as bright as the sun was explained by a tale, known as the contestants of Horus and Set, originating as a metaphor for the conquest of Upper Egypt by Lower Egypt in about 3000 BC. In this tale, it was said that Set, the patron of Upper Egypt, and Horus, the patron of Lower Egypt, had battled for Egypt brutally, with neither side victorious, until eventually, the gods sided with Horus. As Horus was the ultimate victor he became known as Harsiesis, Heru-ur or Har-Wer (ḥr.w wr ‘Horus the Great’), but more usually translated as Horus the Elder. In the struggle Set had lost a testicle, explaining why the desert, which Set represented, is infertile. Horus” left eye had also been gouged out, which explained why the moon, which it represented, was so weak compared to the sun. Horus was occasionally shown in art as a naked boy with a finger in his mouth sitting on a lotus with his mother. In the form of a youth, Horus was referred to as Neferhor. This is also spelled Nefer Hor, Nephros or Nopheros (nfr ḥr.w) meaning ‘The Good Horus’. The Eye of Horus is an ancient Egyptian symbol of protection and royal power from deities, in this case from Horus or Ra. The symbol is seen on images of Horus” mother, Isis, and on other deities associated with her. Horus was also said to be a god of war and hunting. The Horus falcon is shown upon a standard on the predynastic Hunters Palette in the “lion hunt”. Thus he became a symbol of majesty and power as well as the model of the pharaohs. The Pharaohs were said to be Horus in human form. Furthermore, Nemty, another war god, was later identified as Horus. World-renowned Egyptologist Dr. John Taylor was viewing the museum’s Egyptian collection when a name on a papyrus fragment caught his eye. Dr. Taylor is the curator of the British Museum’s mummy collection. The British Museum currently has a mummy exhibition on display at the Queensland Museum. He was taken to the museum’s storeroom to see more and says what came next is a once-in-a-lifetime discovery. “After a very short time it became apparent that we did indeed have many fragments of the Book of the Dead,” he said. Dr. Taylor says the rare specimens belonged to a high priest of the Temple of Amun, around 3,400 years ago. “This is not the papyrus of just anybody, this is one of the top officials from Egypt at the peak of ancient Egypt’s prosperity,” he said. “So it is a significant find, and if we can reconstruct the whole document that’s going to tell us a lot. Dr. Taylor says the discovery was thrilling and unexpected. “At first I couldn’t really believe this could be the same man, but indeed it turns out to be him,” he said. “It doesn’t happen very often, not in this way. You get a really special feeling. Queensland Museum chief executive Ian Galloway says the manuscript fragments were donated to the museum by a woman 100 years ago. The museum has a name but does not know how the fragments came to be in her possession. The museum is now trying to track down her family. “We are incredibly surprised that we had such a significant object in our collection,” Mr. Galloway said. He paid tribute to the museum’s past curators for keeping the fragile fragments in such good condition. There was no doubt the rare manuscript would boost interest in the Queensland Museum, and potentially the value of its collection, he added. “I would say they are priceless,” he said. 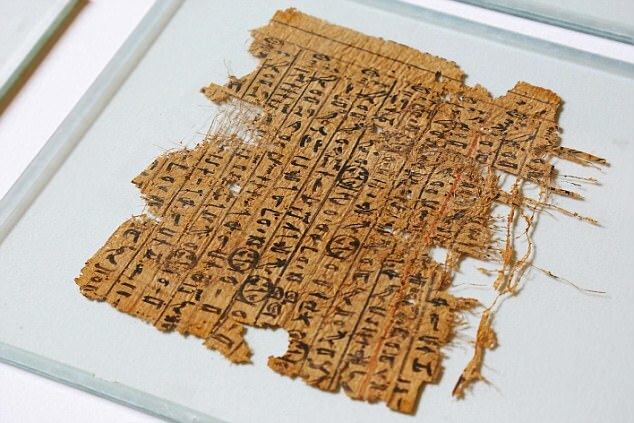 The fragments will remain in Brisbane and scholars are expected to attempt to piece together the papyrus on a computer using photographs. The tombs of ancient Egyptian pyramid builders suggest these artisans were respected — and paid — for their work. 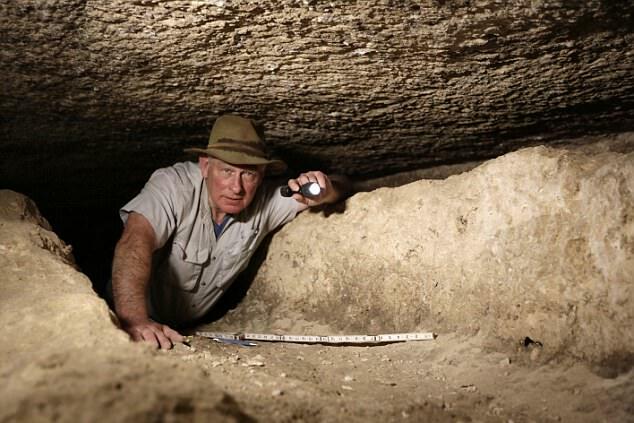 The series of modest nine-foot-deep shafts held a dozen skeletons of pyramid builders, perfectly preserved by dry desert sand along with jars that once contained beer and bread meant for the workers’ afterlife. Graves of the pyramid builders were first discovered in the area in 1990 when a tourist on horseback stumbled over a wall that later proved to be a tomb. Egypt’s archaeology chief Zahi Hawass said that discovery and the latest finds last week show that the workers were paid laborers, rather than the slaves of popular imagination. Hawass said the builders came from poor Egyptian families from the north and the south, and were respected for their work — so much so that those who died during construction were bestowed the honor of being buried in the tombs near the sacred pyramids of their pharaohs. “No way would they have been buried so honorably if they were slaves,” he said. The tombs contained no gold or valuables, which safeguarded them from tomb-raiders throughout antiquity. The skeletons were found buried in a fetal position — the head pointing to the West and the feet to the East according to ancient Egyptian beliefs, surrounded by the jars once filled with supplies for afterlife. The men who built the last remaining wonder of the ancient world ate meat regularly and worked in three months shifts, said Hawass. It took 10,000 workers more than 30 years to build a single pyramid, Hawass said — a tenth of the work force of 100,000 that Herodotus wrote of after visiting Egypt around 450 B.C. “Their bones tell us the story of how hard they worked,” Okasha said. Egyptian Pyramids Found With NASA Satellite | As many as 17 pyramids, more than 1,000 tombs and 3,000 settlements were uncovered using infrared technology. NASA satellite technology has revealed previously unknown sites from the ancient Egyptian world. The satellites used powerful cameras that can pinpoint objects less than three feet long on Earth’s surface. The technology was helped by the density of houses and other buildings, made of mud brick so that they showed up somewhat clearly. Archaeologists have uncovered as many as 17 buried pyramids in Egypt with the help of NASA satellite imagery, according to a documentary to be aired by the BBC on Monday. Led by researcher Sarah Parcak at the University of Alabama at Birmingham, the team has already confirmed two of the suspected pyramids through excavation work. The BBC, which funded the research, released the findings this week ahead of a broadcast describing the technique and what was uncovered. The team also found more than 1,000 tombs and 3,000 ancient settlements, according to the report. Infrared images, which were taken by satellites orbiting 700 kilometers (435 miles) above the Earth, revealed the below-ground structures. The satellites used powerful cameras that can “pinpoint objects less than one meter (three feet) in diameter on the Earth’s surface,” the report said. The technology was helped by the density of houses and other buildings, made of mud brick so that they showed up somewhat clearly against the looser soil cover. The documentary, “Egypt’s Lost Cities,” airs Monday on BBC One and will also be shown on the Discovery Channel in the United States.